Cody Barton and Evan Rumble make me want to go back to high school. Seriously. These two high school teachers are bringing life back to the classroom by bringing the world back to their students. What started as a spring break exploration of New Orleans exploded into a radical idea to use these adventures to inspire their teaching. Home from their Radical Sabbatical renewed and enthusiastic about teaching, they are inspiring their students to learn about the world and to make the connection between the classroom and what awaits outside of it. Dynamic Duo: Cody and Evan are the perfect team with amazing energy. They knew each other while in high school in the Vancouver area, but went separate ways after high school. Both decided to teach high school and came back to the Portland area. Cody teaches English, and Evan teaches arts and ceramics. Cody and Evan reconnected and started to hang out during their free time. Second Line New Orleans This year, Cody and Evan decided to take an adventure together over spring break to New Orleans. Evan wanted to visit the art museum in New Orleans, while Cody wanted to see the places and streets from one of his favorite books, The Confederacy of Dunces. As it turned out, the vacation became so much more when they rented bikes and decided to follow a Second Line Parade. Joining the Parade: Heralding the tradition of the famous jazz funerals, a Second Line Parade is a type of roving block party that meanders through neighborhoods. Each parade has a jazz band, dancing and participants in beautiful costumes. The parades invite crowd participation, and people are welcome to join and follow the parade. Cody and Evan did just that. The Hidden Wards of New Orleans: Participating in a Second Line Parade introduced Cody and Evan to the New Orleans most residents know but tourists rarely see. This wasn’t the French Quarter of glossy tour guides or Mardi Gras posters. Cody and Evan met the people who live in this city, learned about their lives, and experienced their culture. “It was remarkable,” they said. “We were heroes as teachers.” The public educational system was also demolished in the aftermath of Hurricane Katrina. The Soul of New Orleans: Cody and Evan discovered a re-segregated city. This is a city where education has been privatized, where neighborhoods are forgotten. Cody and Evans visited these areas of the city. They connected with the people who live there and learned the city’s rich culture that lives off Bourbon Street. The city’s soul is not the French Quarter, but where the people live. Cody and Evan were energized and excited to bring what they learned back to the classroom. Radical Sabbatical Comes to Life: On their flight home they sat next to Jeany Park of Compass Ross Video completely by chance. Despite being tired from their journey, they were bubbling with excitement. Together, the three of them hatched a plan they dubbed “Radical Sabbatical.” Cody and Evan want to continue to take these spring break journeys to inspire their teaching. Ultimately, they want other teachers to get the same experience too. 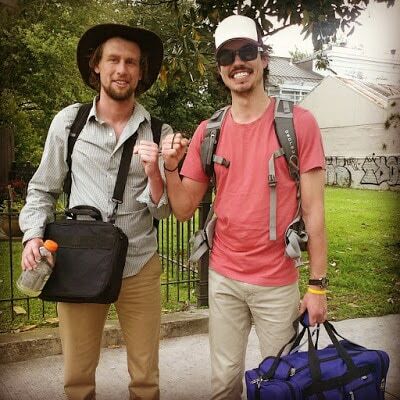 Cody and Evan believe Radical Sabbaticals can inspire other teachers and the students with whom they share. These trips will also help prevent teacher burn-out. Radical Class: For example, Evan took pictures of the beautiful Mardi Gras Indian masks and brought them back to his ceramics class. The class discussed the history, the culture, and how art interrelates to life and culture. Even if no one decided to make a mask, I think the discussion showed them how art is a beautiful expression in every day life that is not just limited to a museum or art gallery somewhere. Curiosity Rocks: Cody and Evan are also showing their students how it’s fun and cool to be curious and to learn. Here are two young, hip teachers on a vacation in New Orleans having a blast learning from real life. They are showing how learning isn’t limited to the classroom or to a specific subject. They are showing how learning and curiosity are what makes life rich. They are demonstrating how what is taught in the classroom can relate to the world and not just a score on a test. The Movement: Soon, Cody and Evan will be launching a crowd funding campaign to support the Radical Sabbatical dream. They are looking for support for their next spring break journey. They’re thinking about heading up to Minneapolis. Their travel plans are not luxurious. They plan to stay in Air BNBs, rent bikes to see the city, meet and mix with the people of Minneapolis, and connect with other educators there. Of course there’s an art museum to visit, and Cody will find a book to read. Cody and Evan will ask their students to help plan the Radical Sabbatical, embedding the spirit of curiosity in them too. Radical Sabbaticals for All: After talking with Cody and Evan I was ready to go to New Orleans and learn about its history and culture. Minneapolis is sounding kind of cool too. I hope Cody and Evan succeed in launching a movement that encourages other teachers to also embark on Radical Sabbaticals. I think these experiences can be invaluable for the teachers and their students. How can we not take the chance to encourage curiosity and bring inspiration to the classroom? Don’t we want enthusiastic teachers? Isn’t education more than just passing a test, but also gaining an understanding of our world and our cultures? Support Radical Sabbatical by following the two teachers on Facebook. Stay tuned for the crowd funding launch later this summer. Check out some videos from the Second Line Parade! Check out this fun video from Cody he used in his classroom (not from the trip to New Orleans)! As a lifelong learner, I know that staying vital helps me in my life be the best me. Congrats on this great project.